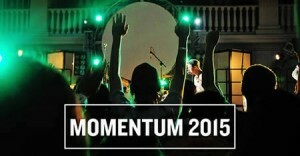 Registration is now open for Momentum Youth Conference, the annual youth gathering sponsored by CE National. It will be held July 14-19 at Indiana Wesleyan University in Marion, Ind. The week will host speakers such as Sean McDowell, Clayton King, Jackie Hill Perry, Naghmeh Abedini, and more with worship lead by the Jordan Howerton Band. Sign up at buildmomentum.org/register. A $75 deposit by March 31 will secure the best rate. Click here for more information.